One herb that is easy to grow and useful in the kitchen is culinary sage, cooking sage or Salvia officinalis (pictured right) which is widely grown in herb gardens across the UK. This is another herb from the Mediterranean that is widely used in many cuisines, and also used for its medicinal properties sage is also commonly used including traditional British cooking. Yes you can easily 'grow your own' in either the herb garden or pots and containers and fresh leaves have a fantastic range of uses. Saltimbocca is a favourite, with chicken thyme and garlic, makes a great herb for a roast and what about Tortelini with sage butter. A perennial herb used widely with meat dishes including roasts and many Italian dishes it is also useful as an ornamental plant, the purple flowers are attractive and the gray green foliage looks great in the cottage garden setting. Try growing in a sunny position in a well drained humus rich soil, sage will take a little more water than some herbs but does still not like wet feet. You can propagate sage plants from woody cuttings, however sage will also 'spread by sending down roots from parts of the plant that touch the ground, so although it is not really clump forming you can often get a few new plants by this method. Long lived, and even better performing if you keep trimming bits off for use in the kitchen a few horticulturists say plants need to be replaced every few years, ours are 10 years old and doing well thank you. Yes you can harvest in the first year, as long as the plant is big enough, use the leaves fresh or allow to dry in a cool dry position, some people use drying boxes and paper bags, however if you harvest mid summer a cool dry spot will do, hang it up so the air circulates. Yes sage can be pruned back, but try not to go to far back into old wood or you may strike problems. Growing sage in a pot, no problems. 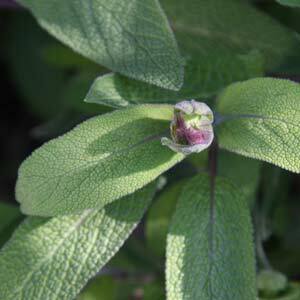 Sage plants are available for sale online from specialist herb nurseries listed.